The Digital Pulse (the pulse in the fetlock joint) is faint and hard to find on a healthy horse that has been standing quietly. When a horse has been worked hard recently, the pulse will be strong and very obvious, and as you let your fingers rest on it, you can feel the pressure build then release smoothly as the blood perfuses the hoof. If a horse has laminitis or an abscess, blood perfusion through the hoof is interrupted by the pressure caused by inflammation, and the digital pulse starts to “bound”, and is referred to as “a bounding pulse” because the blood starts to enter the hoof, the congestion in the hoof stops the surge of blood, it “bounds” back up the vessel and is shunted around the hoof to a vein. The pulse seems to “bounce” under your finger. 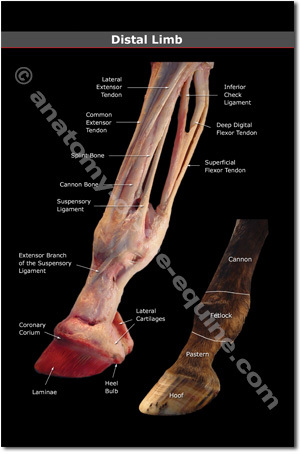 There are two arteries on each leg that move blood to the foot, and the best place to access them is over the sesamoid bones on the inside and outside of the back of the fetlock joint. Use your fingertips to push from the side of the fetlock joint around towards the back, like you are trying to push something ahead of them underneath the skin. I suggest learning to locate them by lunging a horse for a few minutes to get a stronger pulse, then feel for the pulse. Its important to learn to detect the difference between a strong healthy pulse and a “bounding” pulse. This entry was posted in Hoof Health, Horse Care, Horse Health and tagged bounding pulse, founder, laminitis. Bookmark the permalink.